“WE ARE NO BETTER THAN THE PEOPLE WHO ELECTED US – AND I STRONGLY BELIEVE IN THESE WORDS” – The words of a former PM of Victoria Stephen Bracks. This is the personal philosophy of Jude Perera who is mostly identified as an unassuming, down to earth and approachable person. 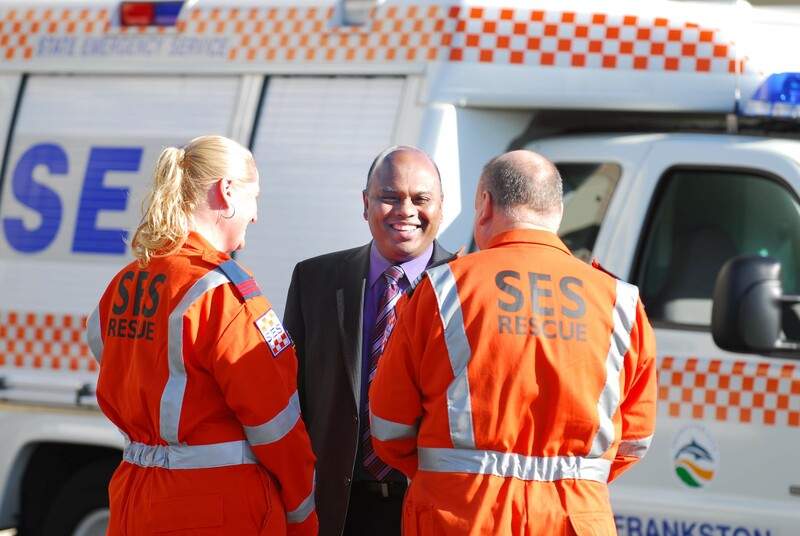 Sri Lankan born Jude Pereira is the State Member for Cranbourne District in Victorian Legislative Assembly. Jude was the first and so far the only Sri Lankan born Australian to be elected to serve in any Lower House Parliament in all of Australia. He is up to now, the only Sri Lankan born person to be elected to a Legislative Assembly for a consecutive three terms anywhere in the world. It was a day of record breaking heat in Victoria, with some places having their hottest November day in over a century. That was the day that my son Diresh and I visited Jude Perera at his very cosy residence in Sandhurst. Beginning with Jude’s childhood, he mentioned to us that he was born on May 27, 1953 on a wesak full moon poya day. Jude’s father who used to hunt for pleasure had formed this myth that he was never able to hunt an animal if Jude went along with him just because he was born on wesak being the most sacred day for the Buddhist. From Grade 2 he attended Maria Stella College in Negambo and then received a Bachelor of Science Degree from the University of Jaffna. This topic of education and university brought up the memory of a major riot between the police and the ethnic groups which occurred in the final years of Jude’s university education. This incident resulted in students being transferred to a university in the South of Sri Lanka. Asking him the question if anyone during his childhood that inspired him to be who is today, he stated that he comes from a family with a political background. His grandfather was involved in politics and his father Edmond Perera was actively involved in the Lanka Sama Samaja Party (LSSP) and was appointed to the Chair of the Village Council and later contested for the Divulapitiya electorate. Judes’s mother Mary Pearl was a teacher who never got involved in any politics but was an advocator for Sri Lanka Freedom Party ( SLFP). To my question to name a few places he worked in Sri Lanka, Jude stated that he worked only in CW Mackie then located at D.R. Wijewardane Mawatha. 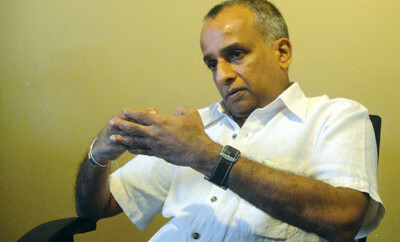 The Managing Director at that time was Karu Jayasuriya . Jude started as an Executive Trainee in the Produce Export Division and then moved to the Computer Division as a Computer Programmer when the first computer was installed. My next question to him was how he began his life in Australia and Jude went on explaining in detail the reasons behind his decision to move overseas. During President J.R Jayawardena’s era in 1977, inflation was extremely high and people found it difficult to survive on a monthly salary. He was ofcourse married then and had decided he should look for work overseas. Coincidently, Jude had happened to be actively involved in Vijaya Kumaranathunge’s political party Sri Lanka Mahajana Pakshaya and was the Chief Organizer for the Katana area during this time. Things were not going his way and a job in the Middle East was not appealing to him as well. Therefore, when a job offer came in the Pacific Island called New Way where there was about 2000 population and the people there held New Zealand Passports and survived with New Zealand funding, as a UN volunteer in 1985, he had immediately accepted the assignment. After 1 year, he had moved to New Zealand where Jude’s wife Irangani and his two children joined. In 1988 had moved to Australia with his family. What motivated you to enter into politics in Australia? In 1992 state elections labour party did very badly. Jeffery Kennett was the leader of the liberal party. He was brutal and tough he thought all problems were because of the working people. He was a follower of Margaret Thatcher and Ronald Regan. This was the time that I thought to myself what am I doing with myself and after having experience in the LSSP in Sri Lanka, I knew I could give something towards the labor party. I also thought it would be good to get involved in politics and to share whatever knowledge and experience I have gained over the years. To come up to this stage in politics as the first Sri Lankan born, what was the journey like and are there any people who inspired you or any names you would like to mention? I am the first Sri Lankan born to be a member of the Lower House. However, I need to mention that Fred Van Buren who migrated to Australia in 1950 was a Member of the Upper House, which is the senate. He passed away recently. As a result of all the work I carried out from 1992, during the 1996 elections I was offered two choices by Dale Wilson one was to be the Campaign Director to the Candidate or to be the South Eastern Province Candidate. During this time it was classified as Cranbourne being an unwinnable seat. The question I asked Dale Wilson at that time was why me? The answer I got was “you work harder and more than anyone in the local area”. I did not win the elections that year but the exposure gained was immeasurable and I learnt the tricks of the trade. Towards 1999 I was in a stronger position and I grasped very quickly how the labor party worked. Can you be a bit specific about your role as Parliamentary Secretary to Shadow Minister for Multicultural Affairs. In simple terms it means losing your family life and your weekends!! Multicultural port folio and Shadow Minister is Daniel Andrew the leader of the Labour party himself and I report directly to him. The role of the Secretary is basically when closer to the elections to participate in policy formulation. However, before that I am required to work with different ethnic groups as Victoria is a hugely multi cultural state and understand their issues and really get to know them and observe their behavior as that would eventually assist in policy formulation during the next elections. In your role as a MP, what sort of projects have you personally initiated for the betterment of the Sri Lankan-Australian community? I have not done anything specific only categorizing the Sri Lanka-Australian community. During a flood time and Tsunami time I was able to get financial grants but this was not my initiative but I was consulted since I am Sri Lankan born. I see my role as a MP not only for the Sri Lananka-Australian community. If anyone from the Sri Lankan-Australian community wants my assistance to lobby the government I would readily do so. I work with every community and I think myself as a global person. On the same note, how do you think one should navigate in keeping a balance of maintaining the Sri Lankan identity while being a proud Australian ? I was born in Sri Lanka that is my heritage and I value certain Sri Lankan values but I see myself as a global person. I have achieved a lot in Australia. So I avoid using this kind of terminology it kind of does not make sense to me. There are many Sri Lankan-Australians who are entering into politics in Australia – especially with regards to the council elections .. any advice or any insight you can share with them? You got to first understand the Australian politics. A person cannot enter into politics in Australia just because there may be a large number from your ethnic group in that state. You may think that would qualify you to win an election but it does not work like that with politics in Australia. You got to learn a lot especially to work with people and work with different types of people, different cultural groups, etc. It is a people’s game, so you need to work hard and be committed, deliver what is expected and promised, not be over ambitious. It is definitely encouraging to see Sri Lankan-Australians entering into politics in Australia. There are some very good talented individuals I know personally who are doing great.. Focusing away from politics, something I noticed in Jude’s house was many framed family photographs which showed another side of him as a family man. His wife Irangani joined us during this time and showed photographs taken of each grandchild during their special moments. Their daughter Judy is married to Suranga and has two children Jasmine and Jordan. 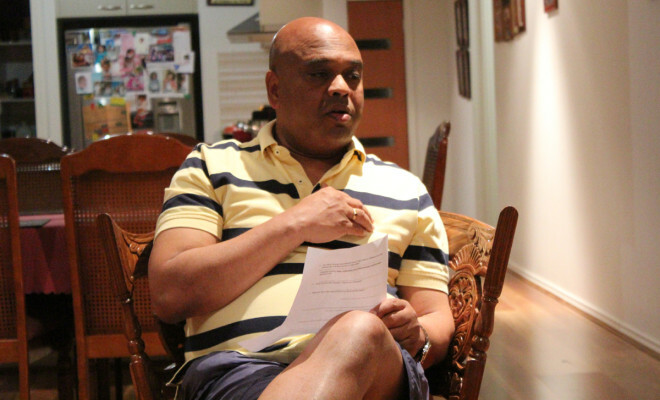 Jude said his son Rangana used to tell that he may have voted for liberal if Jude was not a candidate for the labor party. Rangana is married to Helena and has a little daughter Ella. There was so much tenderness in their voices when they spoke about their three grandchildren which is a clear indication that when not in political business Jude enjoys the pleasures of his closely knit family.